New York: In her first interview since her stunning presidential election defeat by Republican rival Donald Trump, Hillary Clinton on Thursday called for the United States to bomb Syrian air fields. 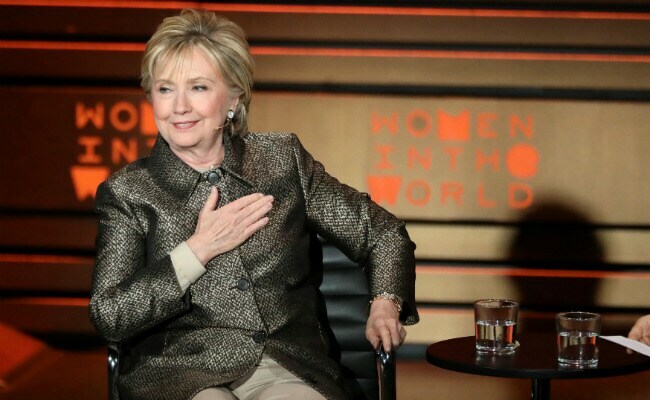 Clinton, in an interview at the Women in the World Summit in New York, also called Russian interference in the 2016 presidential election a theft more damaging than Watergate. Asked whether she now believes that failing to take a tougher stand against Syria was her worst foreign policy mistake as secretary of state under President Barack Obama, Clinton said she favoured more aggressive action against Syrian President Bashar al-Assad. "I think we should have been more willing to confront Assad," Clinton said in the interview, conducted by New York Times columnist Nicholas Kristof. "I really believe we should have and still should take out his air fields and prevent him from being able to use them to bomb innocent people and drop sarin gas on them." Clinton noted that she had advocated for a no-fly zone in Syria after leaving government, something that Obama opposed. Her remarks came two days after a poison gas attack in Syria that killed at least 70 people, many of them children. The US government believes the chemical agent sarin was used in the attack. The United States and other Western countries blamed Assad's armed forces for the worst chemical attack in Syria in more than four years. Trump said on Thursday that "something should happen" with Assad after the attack, as the Pentagon and the White House studied military options. When asked about Russian interference in the presidential election she lost as the Democratic candidate in November, Clinton called for a bipartisan investigation. "I don't want any Republican candidate to be subjected to what I was subjected to....I don't want anybody running campaigns to have their communications stolen," she said. US intelligence agencies have said that Russia provided hacked material from the Democratic National Committee to WikiLeaks through a third party. Russia has denied the hacking allegations. "It was a more effective theft even than Watergate," Clinton told Kristof before an audience of about 3,000 people at New York's Lincoln Center, referring to the US political scandal of the 1970s that led to the resignation of President Richard Nixon. "We aren't going to let somebody sitting in the Kremlin, with bots and trolls, try to mix up our election. We've got to end that and we have to make sure that is a bipartisan, American commitment." Representative Devin Nunes, a Republican, earlier on Thursday stepped aside from the congressional inquiry into Russian meddling in the US presidential election because he is under investigation for disclosing classified information. Representative Mike Conaway, the second-ranked Republican on the House of Representatives intelligence committee, will now lead the probe. Clinton attributed her White House loss to both Wikileaks and FBI Director James Comey's sending a bombshell letter to Congress only days before the election announcing he was reinstating an investigation into her emails. Asked whether it was bittersweet to watch the stumbles of the Trump administration in its early days, she declined to agree. "I don't take any pleasure in seeing the kind of chaotic functioning," Clinton said. Clinton said she has no intention of another run for public office and said she is writing a book that, in part, delves into just what derailed her attempt to become America's first woman president. "For people who are interested in this, the nearly 66 million people who voted for me, I want to give as clear and as credible an explanation as I can." After US Move Against Iran Oil, India Says "Studying Implications"